← How to convert MS Office document of xls to jpg ? 3. 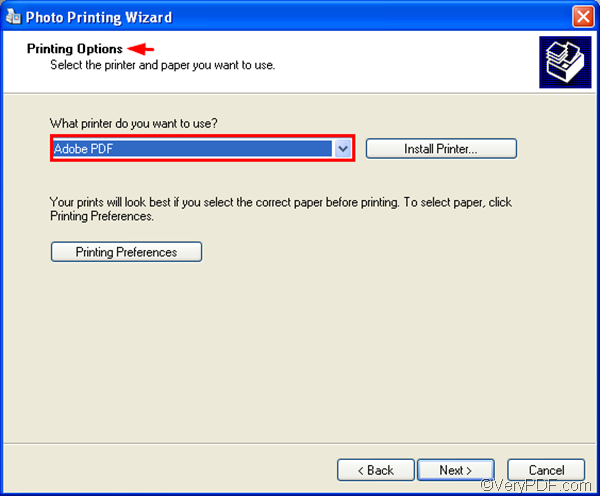 When a dialog box pops out, click Next for two times, and then, you will see Printing Options in the dialog box as illustrated below. In this dialog box, you should select Adobe PDF in the combo box and then click Next. 4. When you see the Save As dialog box, please save the EMF file as a PDF file. 5. To protect PDF file, you should open the PDF properties dialog box to select security options by right clicking the icon of the new PDF file, > click Properties, > click the Security tab and the PDF tab to select options to protect the PDF file. If you don’t have Adobe Acrobat, you should download a command line application such as VeryPDF HTML Converter Command Line, which is a stand-alone application, and can help you convert EMF to PDF and protect PDF in two steps. You can click VeryPDF HTML Converter Command Line to download it and install it on your computer. 1. You should open the command prompt window: Click Start, >click Run, > type “cmd”, >and click OK. Or click Start and then click Command Prompt. 2. In the command prompt window, you should type a command line, depending on the following basic usage and options. After you type a command line, don’t forget to press Enter. Do you want to buy VeryPDF HTML Converter Command Line? If so, please click Purchase.. This entry was posted in HTML Converter (htmltools) and tagged command line, emf to pdf, protect PDF. Bookmark the permalink.